Bach composed his four Lutheran masses (BWV 233-236), sometimes called Missa brevis, between 1737 and 1748 whilst he was Cantor of the Thomasschule at the Thomaskirche in Leipzig. This was a position he was appointed to in 1723 and which he held until his death in 1750. Martin Luther's reforms had brought about fundamental changes to the structure of the Roman Catholic liturgy, where the Kyrie and Gloria were the only parts of the Ordinary to be retained in the Lutheran service. The addition of the Sanctus was reserved for special high feast days. There are four Sanctus settings included here; Bach had the habit of arranging music by other composers for some of these, such as BWV 241, based on a composition by Johann Casper Kerll. In this first instalment by Masaaki Suzuki and the Bach Collegium Japan, we have two of the masses, G minor, BWV 235 and G major, BWV 236. Each consists of a Kyrie and a five-movement Gloria. An indefatigable recycler, Bach rearranged material from his cantatas for these musical parodies. In fact, of the twenty-four movements making up the four masses, only four have not been plundered from previous compositions. My first encounter with these works was via the 'old school' performances conducted by Kurt Redel (BWV 233 and 234) from 1965, and Helmut Winschermann (BWV 235 and 236) recorded in 1969 (Philips 432 494-2). They still sound remarkably fine, and have stood the test of time in remaining potent readings. I've recently acquired the period instrument recordings made by The Sixteen and Harry Christophers (Coro COR16115 and 16120), to my mind excellent in every way. 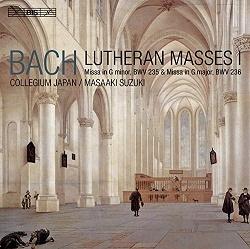 Suzuki and co. have made a series of distinguished Bach recordings on the BIS label. I have quite a number of their cantata volumes, together with the motets and the B minor Mass, and have been suitably impressed by the level of musicianship, polish and refinement of this august ensemble. I wouldn't hesitate to recommend any of their recordings, as I haven't encountered any disappointments to date. Suzuki injects new life into these masses, making them sound fresh and spontaneous. Tempi are generally brisk, lively and rhythmically buoyant. I love the way he energizes some of the choral movements, such as the Gloria of the G minor BWV 235. Clarity of diction is notable in the choral sections. Sensitivity is another compelling feature, as in the Qui Tollis from the same mass, where the exquisite oboe obbligato partakes in an eloquent dialogue with the tenor Gerd Türk. In the Domine Deus of BWV 236, Suzuki achieves stunning blending of the solo soprano and counter-tenor. The bass Peter Kooij has a rich, sonorous tone, and delivers instinctive phrasings and shape to the Gratias in both masses. In fact, all four soloists make an impressive contribution. These works reveal a wealth of ingenuity and invention, and listening to these performances it's difficult to understand why these works have been neglected to quite the extent they have. The Kyrie in C minor BWV Anh.26 (Francesco Durante) / Christe in g minor, BWV 242 and the four Sanctus settings make a welcome addition, as they are relatively unknown and have been rarely recorded; I certainly have never heard them before. Like the masses, Suzuki serves up raptly intense and idiomatic readings, securing favourable results. True to form, this newcomer is in superb sound and balance, the two recording venues proving sonically well-matched and responsive. Klaus Hofmann's booklet notes, in English, German and French, provide useful context and background. Texts and translations are included. I, for one, eagerly await volume 2.